Planning for a barbecue party is fun and exciting. That is until you have to go out and buy all the things that you need. One of the biggest questions that you will surely be asking yourself is—how much prime rib per person? Of course, you would want to make sure that your feast will be enough to feed all your guests. But at the same time, you would not want to serve too much ribs as that can be a serious waste of food, right? With that in mind, it is important that you determine the right amount of meat that you need to buy. Well, we are here to make things a lot simpler for you. Below are the information that you need to know to whip up a prime rib feast! How Much Prime Rib Per Person? Look for a USDA prime grade roast. To save money, go for a choice roast. Go for the roast at the small end of the ribs. Ask for a three-bone rib roast. Roasting the rib at high temperature. Slicing into the ribs right away. Roasting the rib while it is still cold. You do not have to search far and wide or do a trial and error method just to get the answer to this question. That’s because the professional chefs have answered this already! According to the Food Channel, chefs recommend that you plan about one pound of prime rib (with its bone-in) per person. That means that you should prepare one rib for every two diners. If, for example, you will have eight guests, you should prepare a four-bone roast for them. You should prepare a six-bone roast for twelve people, seven-bone roast for fourteen people and so on and so forth. You get the deal! Now that we are done with the most challenging part of buying a prime rib, let us proceed to the other issue that you are going to deal with when buying a prime rib. 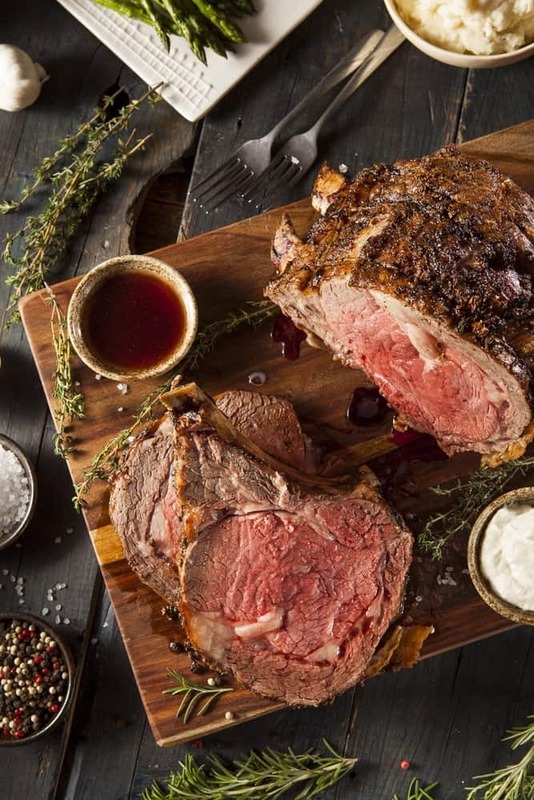 When you are at the butcher, you will be presented with two options for a prime rib—bone-in and boneless roast. What you need to understand is that these two variants come with their own pros and cons and we will discuss that in this section. 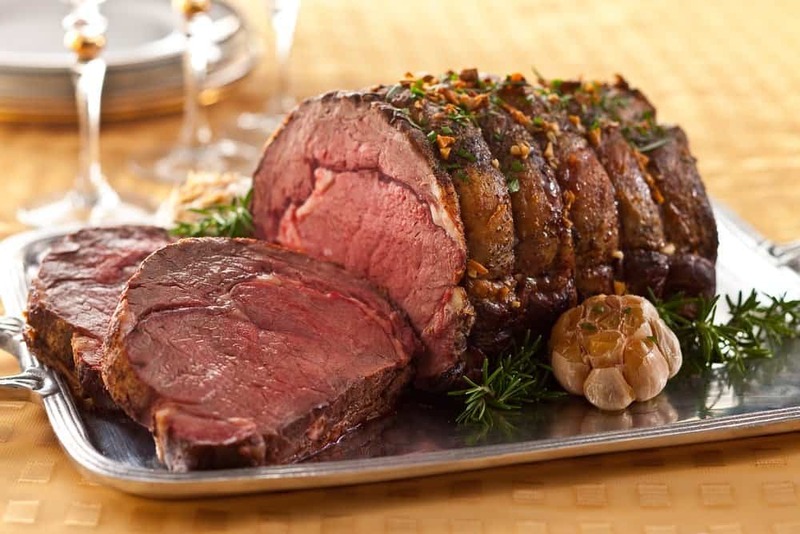 Many people go for a bone-in prime rib simply because it is juicier and more flavorful. 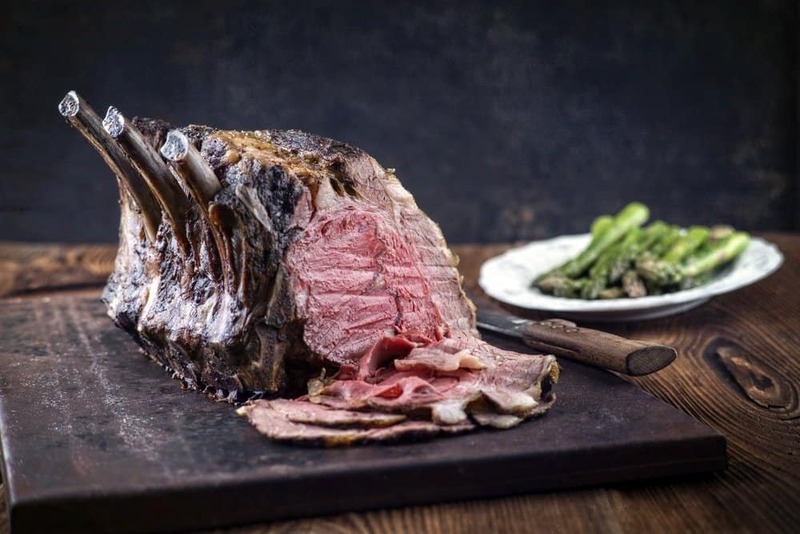 Let us also not forget about the fact that a standing rib roast can be presented beautifully in the dining table, However, this cut is more expensive since the bone is included in the weight of the meat. On the other hand, a boneless prime rib is not as juicy and flavorful but it is a lot more affordable. So you see, the deciding factor here will be your budget. If you have money to splurge, then, by all means, go with the bone-in prime rib cut. But if you are planning to serve lots of guests and your budget is a bit limited, the boneless prime rib is a much more economical option. The USDA prime grade roast has the highest quality and is also considered to be the most expensive. If you want a cut of beef that is tender and has the highest degree of flavor, maturity, and marbling. But please keep in mind that only 2% of beef products are of this grade so it is recommended that you order this in advance. Also, USDA prime grade products are quite rare so you will have a higher chance of getting it from a butcher than a supermarket. Prime grade beef is the best option but if you do not have enough money to splurge, your next best choice would be a choice roast. This option will also be easier to find and is usually available in most supermarkets. Choose the meat at the small end of the ribs (last three ribs) as these contain the smallest amount of fats. This part is also considered to be the most tender and flavorful. But if you are planning to buy a full roast, you can disregard this advice. It only applies to those who are ordering less than a full roast. Many people claim that the smaller the rib roast, the more flavorful and tender it would be after it is cooked. Most people are afraid to ask for these cuts simply because they think that it will cost them more. But the truth is, butchers won’t charge you extra if you know how to speak their language so it is recommended that you do some research about butcher lingo beforehand. Some people love to take a bite of a juicy rib with a rosy and rich interior. However, many people fail to achieve this because they tend to cook their ribs at high temperatures. The right way to cook a prime rib is to cook it as low and slow as possible. Set your oven only to 350 degrees Fahrenheit and cook until you have achieved your desired doneness. On the other hand, many people do not like to brown their roast because they are afraid of overcooking it. For your information, the best roast is one that is crunchy and brown on the outside and juicy and rosy on the inside. To do this, you need to oven-sear your rib. Oven-sear the ribs at 500 degrees Fahrenheit for 15 minutes. We all get excited with the smell and the look of the ribs. We get that but slicing it right after it gets out from the oven is a big no-no. It is recommended that you let the rib’s carryover cooking to subside before digging into it. The rule of thumb is to let the roast rest for about 30 minutes before carving it. Doing so will allow the roast to cook to perfection and at the same time, makes it easier to slice through. When you take the ribs from the refrigerator and straight to the oven, it will take longer to cook. Not only that, it will have more shrinkage as well. If you are throwing a big part, every ounce of meat counts so you would surely not want that, right? The key here is to remove the ribs from fridge two hours before you plan on cooking it. This will give the ribs enough time to thaw and reach room temperature. If you are afraid of possible bacterial contamination, don’t be. Two hours are not long enough for the meat to enter the dangerous bacterial zone. There you go—everything you need to know about preparing prime rib—from how much prime rib per person you should prepare up to the preparation mistakes that you need to avoid. Now, all that you have to do determine what to serve with prime ribs. Personally, I would go for seafoods like scallops or shrimp to get that surf and turf combo. But there are lots of options for you to choose from so go ahead and experiment. Let me know what you chose and how it went in the comments section!